Diversity is the answer to everything, it seems. World peace, weeds, robust ecosystems, soil fertility, pathogens. I think I’ve told you that I’m no fan of antibacterial soap. I would politely thank my mother-in-law for the bottle of whatever antibacterial, Bath-and-Body-Works, super-synthetic, overfragranced soap she would give me at Christmas, but then refill it with run-of-the-mill, this-barely-works-for-beans liquid soap as soon as the original contents ran out. Diversity is our friend. And that goes for the thousands (no joke) of bacteria varieties colonizing our homes and bodies. According to Rob Dunn, doctors in the late ‘50s were struggling with certain Staphylococcus aureus type 80/81 infections of newborns in their hospitals. They did various experiments that wouldn’t meet current standards of medical ethics and came to the realization that, if newborn babies’ bodies were first colonized by beneficial bacteria, 80/81 couldn’t get enough of a toehold to infect anyone. Bacterial diversity provided protection against a particular pathogen. Invasive species have a hard time taking over a field full of lots of different plants, grazed by different herbivores. But an empty field? Or one planted with only one crop? Easy pickings. When we pump that antibacterial soap and squirt that antibacterial cleanser, we might get rid of certain harmful bacteria, but we’re also wiping out the good guys. Then, on our newly clean surface (i.e., our empty field), when something like E. coli wanders over, it finds lots of room to spread out and set up shop. The result? We get sick. Same thing goes for when we kill our gut bacteria willy-nilly. Hence everyone downing the latest, trendy probiotic foods to try to pump up diversity. And the evil bacteria we were targeting in the first place only mutate, share the trait, and come roaring back stronger. What are the best ways to increase diversity in order to prevent the bad guys from taking over? Dunn offers some suggestions. Eating fermented foods made by hand is a good place to start. In fermented foods, like sourdough bread, they find that the flavor is influenced by the microbes present in the flour, on the baker’s hands, and in the bakery itself. Part of why a particular cook’s foods taste a particular way might be because of the particular microbes she and her kitchen pass along! Leave the windows open, to bring more environmental goodies into the house. Wash dishes by hand to prevent “the fungus that lives in dishwashers” everywhere(!). Buy local foods, covered in local soil and microbes. 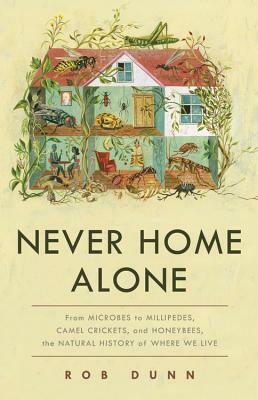 So garden your home and body, this new year, with plenty of diverse microbes, and keep the bad guys at bay!